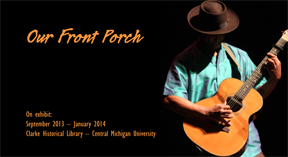 For over thirty years, CMU Public Radio's Our Front Porch has featured the best of Michigan music, recorded live and in concert. Join host John Sheffler, as well as his colleagues Dan Bracken, Peggy Brisbane, and Robert Barclay as they open the Clarke Historical Library exhibit Our Front Porch by reminiscing about the show's storied history. The event will take place on Tuesday, September 24 at 7:00 pm in the Park Library Auditorium. A reception will follow in the Clarke. This event is free and open to the public. And don't forget about the Our Front Porch Concert featuring Billy Strings and Don Julin on Saturday, September 28. At 7:00 pm, Billy Strings and Don Julin will warm up in the Clarke Historical Library in a free and open to the public event. Then, at 8:00 pm, the main event will take place in the Moore Hall Kiva. Tickets for the main event, which can be purchased through Ticket Central, are $15.00 for General Admission and $5.00 for students. The Our Front Porch exhibit is underwritten, in part, by the Cindi J. and Kathryn R. Graham Endowment, with additional support from the Croll Family Endowment and the Friends of the CMU Libraries.